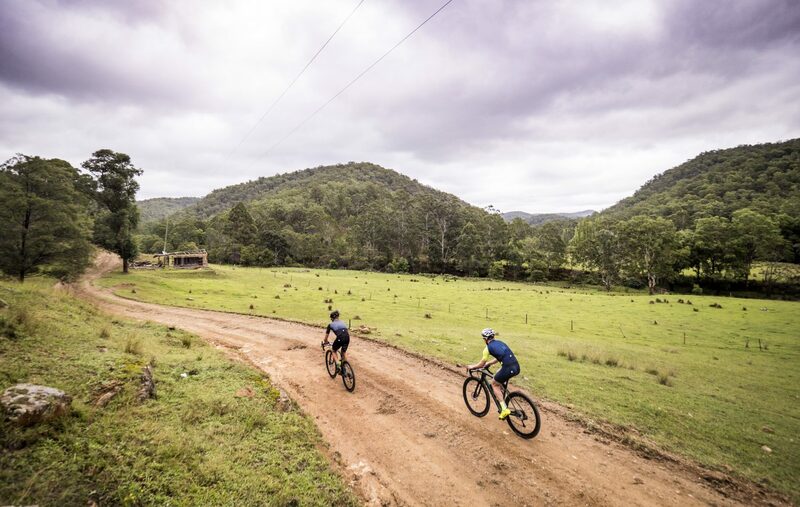 Further down the page, it suggested that visitors should ‘get off-road on 4WD trails or grab a mountain bike and visit for the day.’ All this mountain bike talk made me think this particular ride wasn’t going to be your typical picturesque cruise along pristine roads. It was going to be a tough slog. What we found, however, was a world beyond the realms of what we, a trio of roadies, thought was possible. It’s early Friday evening as Alex, Marcus and I pack the car and head out of town. We don’t get far. Our stomachs churn with hunger and we barely make it around the block before the executive decision is made. We’re stopping for pizza. It’s been a while since I’ve eaten an entire pizza in the backseat of a car, but I’m sure I’ll need lots of fuel to make it through our weekend in Yengo (pronounced ‘Yang-go’). Alex had already warned me there would be no drink stops, servos, corner stores or facilities of any real description on the way. ‘Bring a backpack for on-trail supplies and ensure you’ve got plenty of water,’ read the Big Ride brief. What a night. Bikes on the roof, pizza in the belly, and $1.20 saved on fuel. 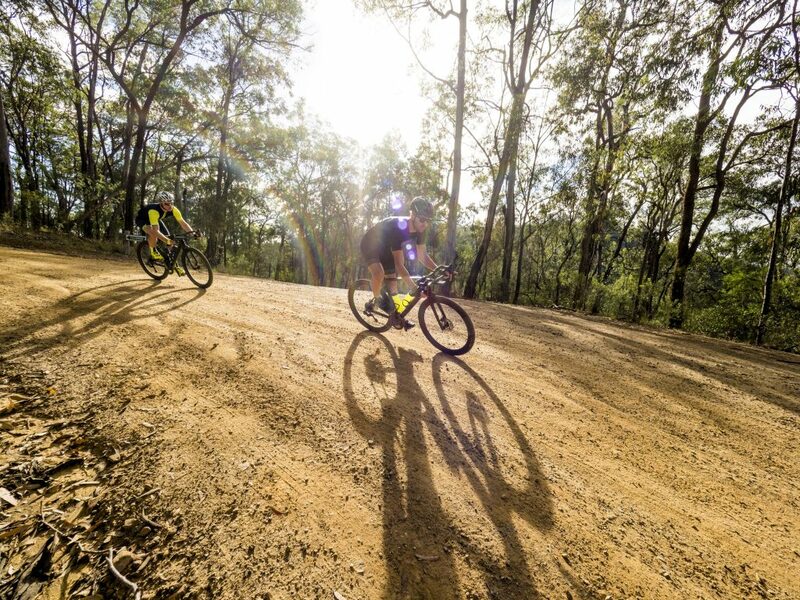 We swing left off the M1 Motorway, not far from Sydney’s sprawling northern suburbs, onto Peats Ridge Road. We follow it for almost an hour, snaking our way through Central Mangrove, Kulnura and Bucketty before reaching our accommodation in a small town called Laguna. It’s dark, but Laguna seems like the sort of place city folk come for a romantic weekend getaway. It’s all thick bushland along with a smattering of paddocks and small dams.There’s no phone reception, and our accommodation has neither Wi-Fi nor a TV. The lack of connectivity forces us to jump straight into jobs. It’s 11pm by the time we unpack our things, rock off for the double bed and fall asleep. 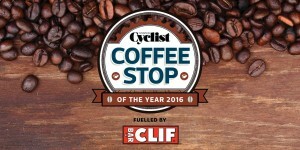 As cyclists, the 5am alarm is nothing new. By the time I rise, after hitting snooze a couple of times (it’s Saturday, after all), Alex and Marcus are already busying themselves in the kitchen, creating bags of scroggin (or trail mix, depending on where you’re from) to sustain them for the day. I follow suit, then fill a small backpack with water, fruit, sandwiches, muesli bars and some fresh-flavoured Endura energy gels – for emergency use only. We roll out of our cottage accommodation a bit before 7am, unsure whether we’re hot or cold, but with a tinge of excitement as another Big Ride is upon us. We’re not your usual bunch of lycra-clad lads. We’re each on fancy gravel bikes in sparkly new clothes, with shaved legs and backpacks bursting at the zips. Marcus in particular is kitted out with accessories. His camera bag is equipped with all the lenses you’d expect a professional photographer to carry. Due to its size, it’s full of things that wouldn’t fit in my bag. We take a guess at its weight – around 8kg – but he’ll be fine. He’s done this many times before. Besides, we’re only going 100km or so, and we’ll definitely be back by lunchtime… right? 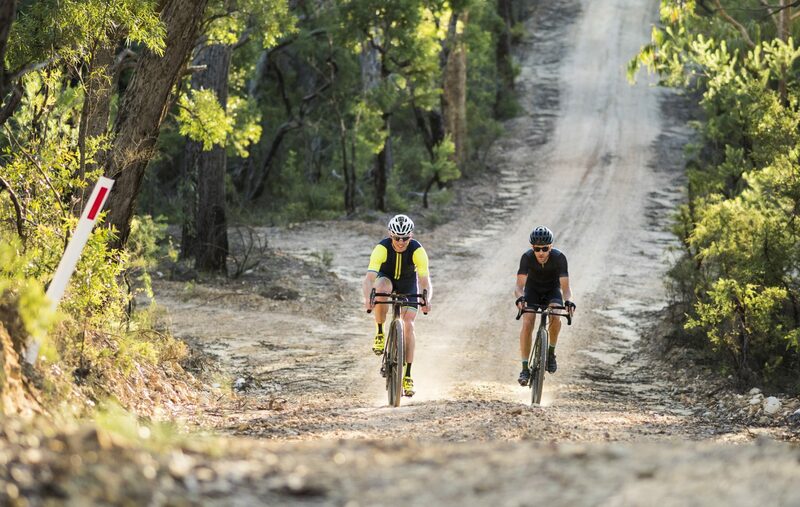 After a few kilometres on Great North Road, we hang a right and ascend Yengo Creek Road. It’s short but steep and gives us the opportunity to chat about what’s ahead. 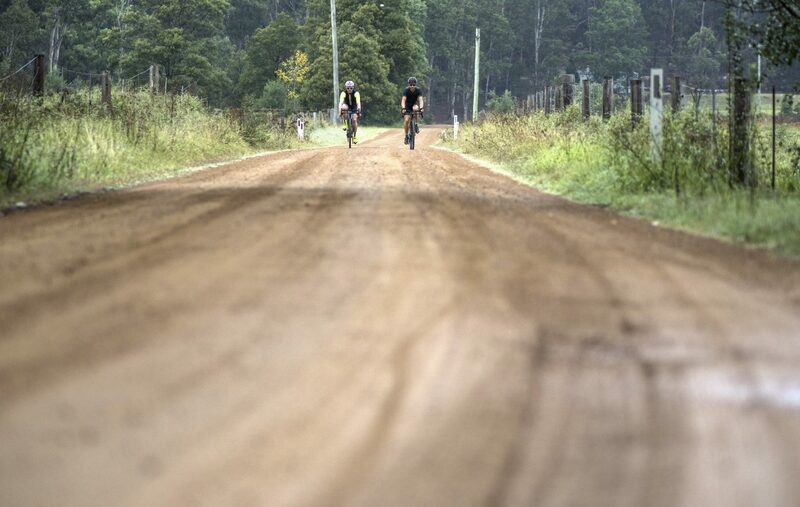 A big sign reading ‘Gravel Road, Drive to Conditions’ greets us at the top of the climb, and we hit the dirt. Gladly, the ‘conditions’ are absolutely perfect. The unsealed road feels almost faster than bitumen, which is a welcome feeling. 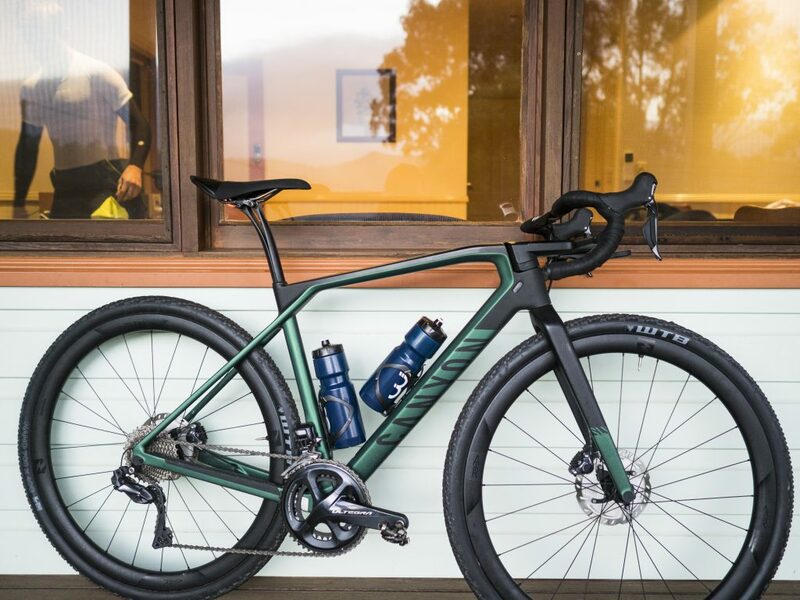 I mean, the Canyon Grail is designed to be as fast as a traditional roadie, but when you’re used to riding something with narrow, slick tyres rather than these knobbly 40mm tubeless monsters, it feels a bit pedestrian. 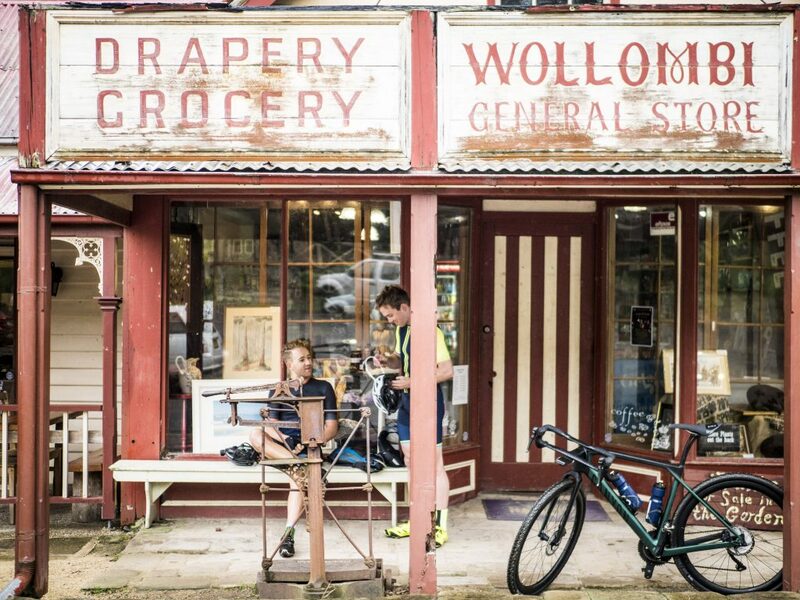 Before I know it, we’ve reached Wollombi, which is a pretty town with all the amenities one needs for any last-minute supplies: a pub (better for post), a couple of restaurants, a campground and an old wool store turned general shop. We stop at the Harp of Erin cafe for a warming drink and talk about how fast we’re getting through today’s adventure. I’ve done this gravelleuring thing before. It’s really not that hard. At this stage, I’m a bit worried I won’t have anything to write about. I’ve written a couple of Big Ride features previously, but those were situated along perfect surfaces in wonderful places. The Snowy Mountains, Gloucester and beyond the borders of Oz. I feel I may have exhausted the ‘go exploring and have a great time’ angle. I couldn’t be more wrong. The next 50km take us more than five hours to complete (though that does include stopping to shoot photos). 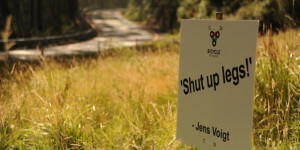 The course is punishing my body in ways I’ve never felt on the road before. On top of that, I encounter additional struggles that, although common for regular off -piste explorers, I hadn’t accounted for. My stockpile of snacks is quickly turning to rations. 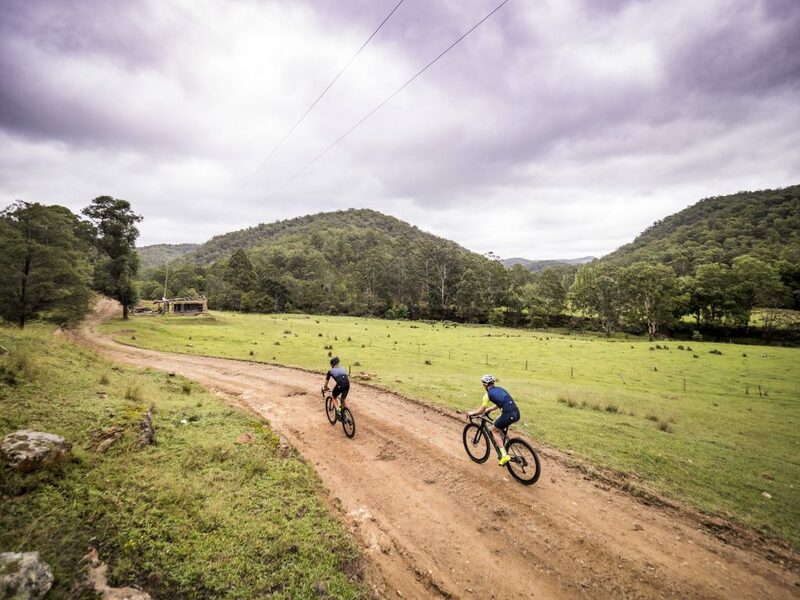 We set off from Wollombi along Paynes Crossing Road before coming to a driveway that I wouldn’t have even considered heading down. After some umming and ahhing from Marcus and me, ride pilot Alex opens the gate marked ‘No entry, private access only’ and gestures us down the tree-lined driveway of number 80 Stockyard Creek Road. There’s little doubt Alex knows where he’s going (even if he appears a little unsure at times), but it feels like our ride could turn into a scene from Deliverance at any moment. There’s safety in numbers, and as we cautiously roll down the driveway, around the corner and past the nice farmhouse, we’re on our way. This is the Old Convict Road. A word of warning for when you ride this section of the trail: be confident with where you’re going. When I say this, I really mean to ensure at least one of you has a GPS unit with full maps and routing. The track thins out to the point where it feels you’ll be bush-bashing for ages, but eventually you’ll see a gate that leads you back on track. I’ve got the route and profile loaded onto my Wahoo ELEMNT, but even then, I’m hesitant when approaching each turn. Once sure we’re on the Old Convict Road, I suspect we’ll continue making some fast inroads. But it isn’t that easy. We pass through another gate and hit a climb that could only be described as brutal. It’s a word that gets thrown around frequently, but few (myself included, before today at least) road cyclists know the challenge of riding up a 15% climb on a loose and rocky surface. Like any challenge, though, the reward is worth the effort. 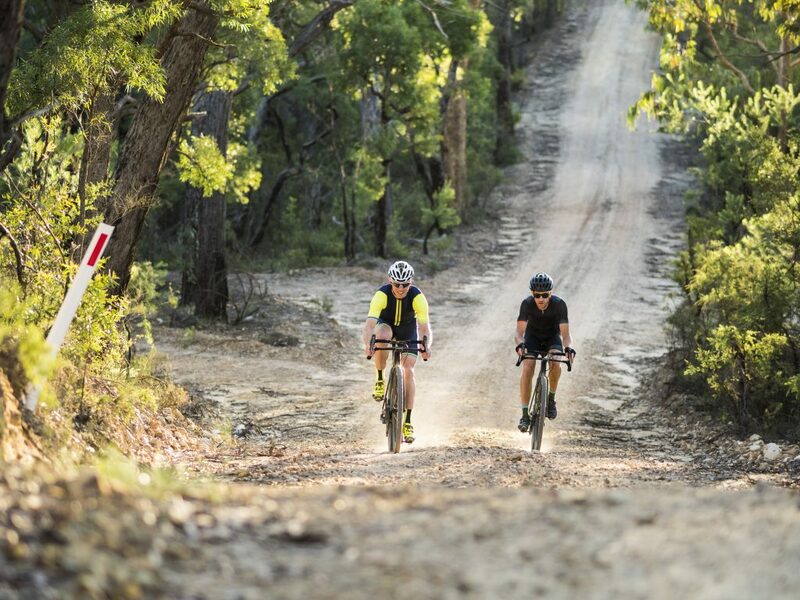 After cresting the first major climb of the day, the three of us stand and peer north, above the trees, where the Pokolbin State Forest and the Yango State Forest collide. Total silence is interrupted only by native bird calls and flies buzzing around sweating cyclists. Usually, when you buckle yourself up a nice climb, the pay-off for the immense physical effort exerted is great. Yes, we’ve savoured the terrific view from the peak, but there’s no long, twisting and fun descent ahead. The next couple of hours is spent grinding up super steep and rocky hills and negotiating tricky descents. 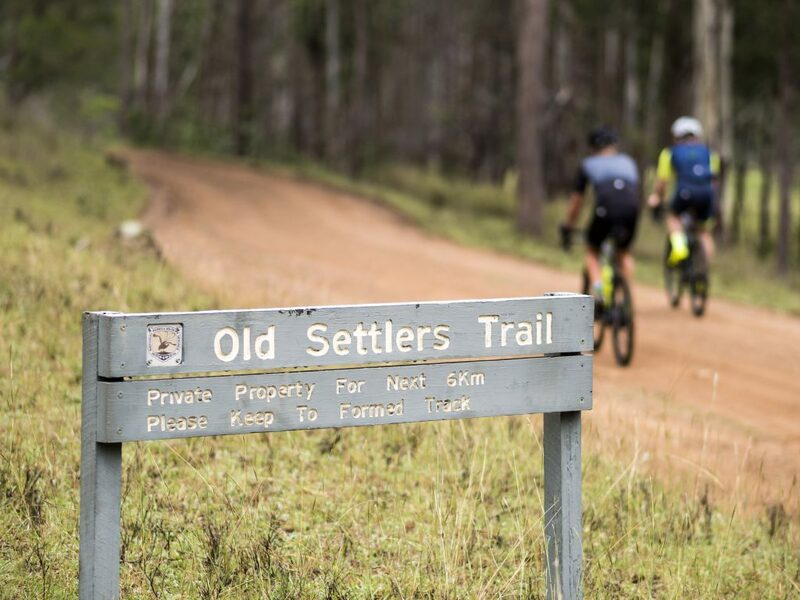 I love an adventure and pushing myself on the bike, but the Old Convict Road has me reaching and surpassing my limits for several hours at once. While Alex and Marcus coast down these steep, rutted and rocky hills, I find myself gingerly negotiating the downs, giving my 160mm Shimano discs a thorough workout. Along the few flat sections, I put it in the big ring and grind a mammoth gear to catch up to the others (whom, I must admit, have waited graciously for me on a couple of occasions). These efforts are often hampered by fishtailing through deep sand or losing concentration as I swerve across the road in an amateurish display of gravel cycling. The more I ride across the challenging terrain, the more I repeat messages I tell other novices when mountain biking: ‘Relax your hands. Keep your arms loose. Let the bike do the work.’ This, it turns out, is easier said than done on a rigid frame with tyres and handlebars half the width of an MTB. Eventually, I feel a bit of flow and gain some confidence. Then, ping! I see Marcus screech to a halt in front of me. Yengo must have claimed its first victim. 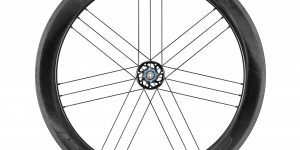 Two broken spokes – not good. Although wobbly, his back wheel is rideable, so we remove the broken spokes. Marcus admits his bike hadn’t been ridden since September the previous year. Alex palms his face while simultaneously reaching for his phone in a spate of laughter. The wounded rear wheel makes me a bit nervous, but we ride on. What else can we do? We need him. Old Convict Road seems to have no end and I’m lucky I can trust my equipment over terrain that takes no prisoners. The Grail is doing a great job at transferring power up climbs and giving me confidence that I can stop when needed on the equally challenging downs. The novelty of the two-up handlebars, dubbed the Hover Bar, begins to wear off, quite literally, as my bare skin continues to rub against the second crossbar. Blisters begin to form. My kit bag included a pair of short finger gloves, but for what I thought would be a glorified road ride, I made the rookie mistake of leaving them in my luggage. I always wear them when mountain biking, but didn’t consider how banged up my hands would get when pounding across rough gravel. Before exiting Old Convict Road, we hit a mighty climb. It comes around the 48km mark and saps what feels like my last stores of energy. It’s not very often I get off my bike to walk – in fact, I can’t remember the last time I walked up a hill – but the combination of a rough surface, fatigue and a long climb that ramps up to 25% is enough to see me unclip and walk to a flatter section. I take solace in seeing Marcus and Alex taking a similar approach. ‘Sometimes it’s just easier to hop off,’ Marcus says. ‘It gives your lower back a bit of a break too,’ Alex adds. Part of me feels defeated by doing this, but a bigger part of me just wants it to be over. I think walking at 5kmh is actually faster than riding the climb, which is a rare and somewhat soul-destroying thought. Would we ever make it out of the Yengo? 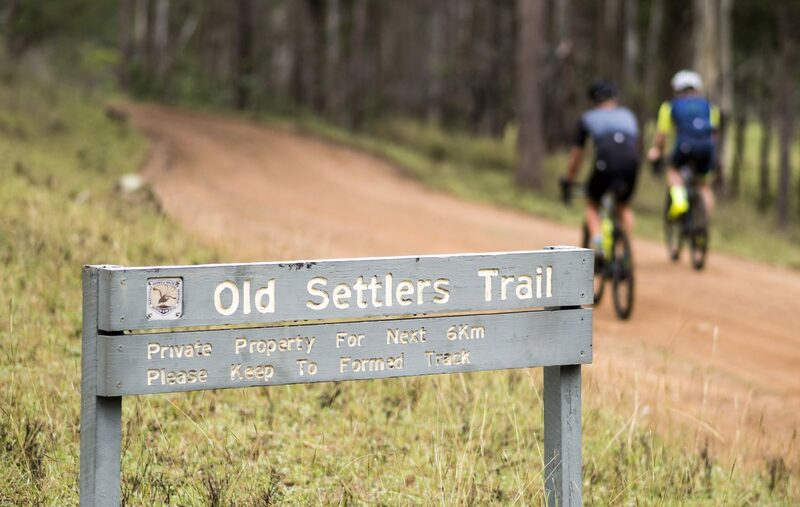 We receive rare respite as we finish Old Convict Road and turn onto Putty Road in search of Howes Trail. I breathe a sigh of relief. Course bitumen has never felt so good. Howes is the most western point of our route and, because it’s used as a 4WD track, I figure it’ll be a touch smoother than the punishment we’ve just endured. There’s good news as we unlatch the gate and re-enter the bush. Howes, at least in the opening section, is far more manageable. Just. The challenge of unsealed terrain is present and the first proper climb is just as punishing. Only now, I’m ahead of Marcus as my roadie legs finally get a chance to stretch. I always say that once a ride that has tested you physically and mentally is finished, you quickly forget the hardships while the best moments remain. This is certainly true as we crest the top of Howes Trail. It seamlessly turns into Finchley Trig, where an inviting lookout lifts Marcus’s spirit to heights not seen since sunrise. We decide to head up the staircase to Finchley Trig at Marcus’s insistence. He says the sunset will make for some stunning snaps. We haul our bikes up to the lookout to the fabulous views of the national park we’ve just about conquered. Such is my weary condition at the top that I hardly notice the family who have set up a picnic of wine, cheese and crackers to watch the sun go down. Reality crashes down on me as quickly as my energy levels and we realise the setting sun means little light for us to get home. We estimate there’s still about 20km left, and with the time approaching 5pm in late April, conversation switches from the breathtaking view to how we should have packed lights before leaving home. Another lesson learned. We hurriedly head back, but every time there’s a break in the tree canopy, we stop to capture the falling light. You’re not around scenery like this every day. I’m feeling a little worse for wear as the final hour of riding hits, so Alex and Marcus insist I eat one of the emergency gels. It doesn’t feel like an emergency, but I accept it regardless. Marcus and Alex do the same, if only to try the new flavours, and now I know that burst of energy is needed if I’m to hold their wheels and make it back to our place under the moonlit sky. I’m exhausted, but in one piece, and concentration is half the battle out here. I have more stories to tell from one day riding the Yengo than the last six months on my road bike. 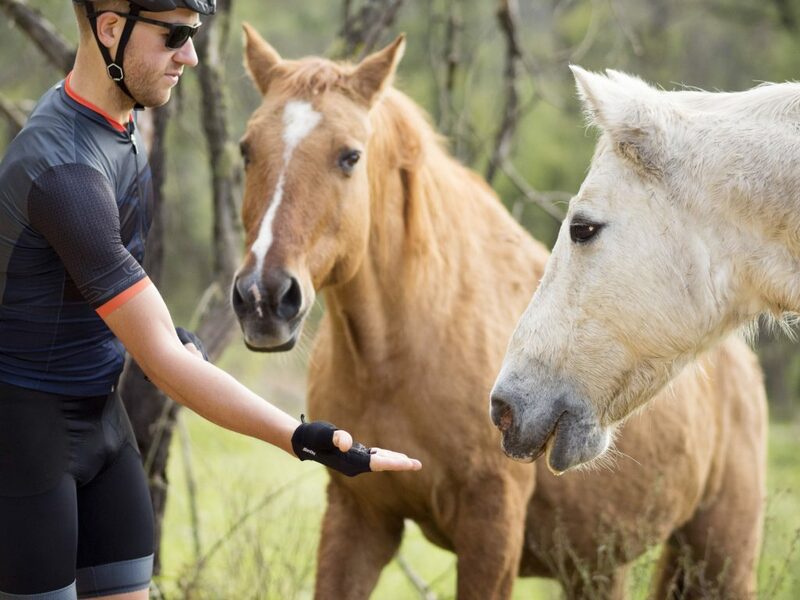 When riding in areas that are off the beaten track and without phone reception, you tend to take more in, and while not that far from the real world, an almost survival mode – where I found myself countless times – is part of the appeal. By day’s end, we’ve covered some serious territory through the Yengo, and while the distance and elevation graph tell the stats, trust me when I say there’s far more climbing than what appears on paper. Reflections like this make me reassess why I ride a bike. 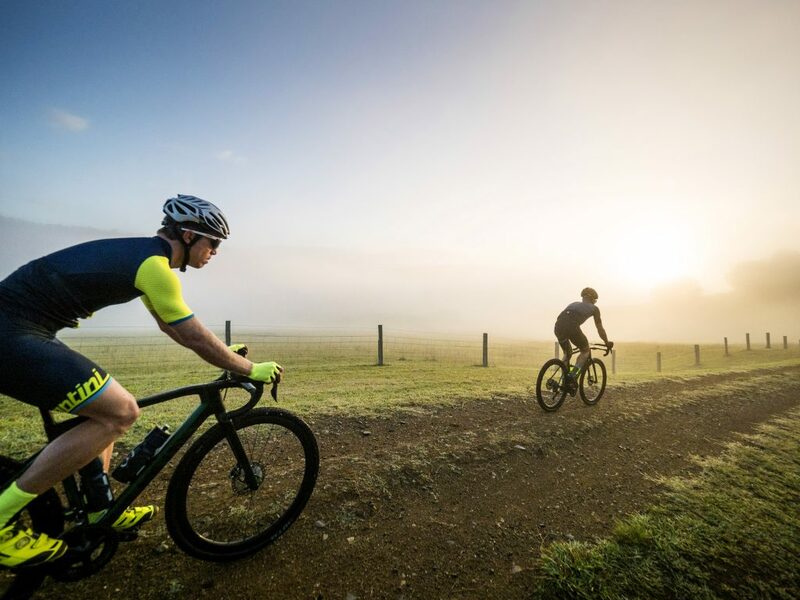 Yes, it’s for fitness and a degree of competition, but in the end, the freedom my bike and my fitness have given me to tackle this challenge was greater than anything else I’ve achieved on the road in recent times. Yengo is a different kettle of fish to what I’m used to, but looking back, I only remember the best parts of the ride. It makes me want to search for more rides that are defined by more than just average speed, heart rate or power. 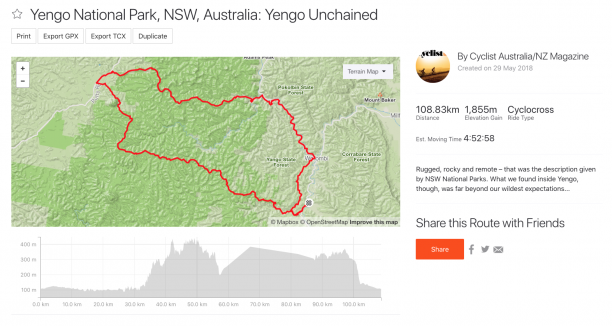 To me, Yengo is the kind of adventure cycling that everyone should experience. Just remember to pack for all contingencies. Jack Lynch is a cycling writer who’ll be far better prepared next time he ventures into the wilderness. Driving is the only way to get to Yengo NP, but it’s less than two hours’ drive from Sydney or Newcastle. The trip from inner-city Sydney is quite simple; head north over the Harbour Bridge and up the highway onto the Pacific Motorway. 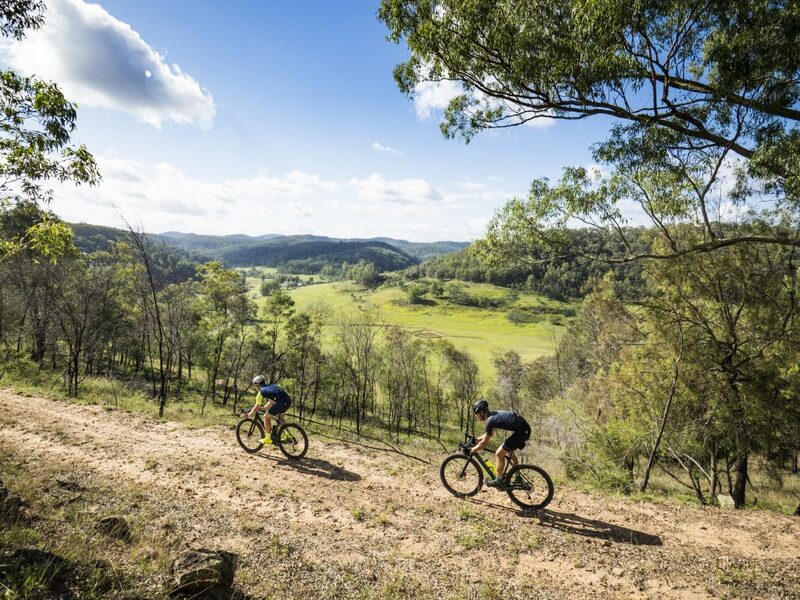 Turn left onto Peats Ridge Road (about 20 minutes past the Hawkesbury River) and follow the road’s various iterations north along the ridge for about an hour. We stayed in Laguna at a nice cottage from Airbnb, but there are plenty of places to stay in the area, including campgrounds. 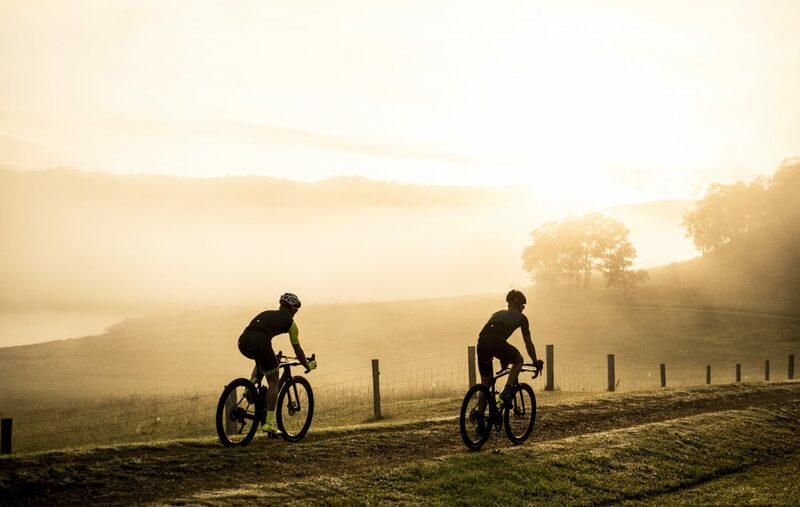 It’s also possible to complete the ride if you’re keen to get up early and drive to Laguna where you can park the car and kick off with a hearty breakfast. In Laguna, there’s only one shop: the Great Northern Trading Post. 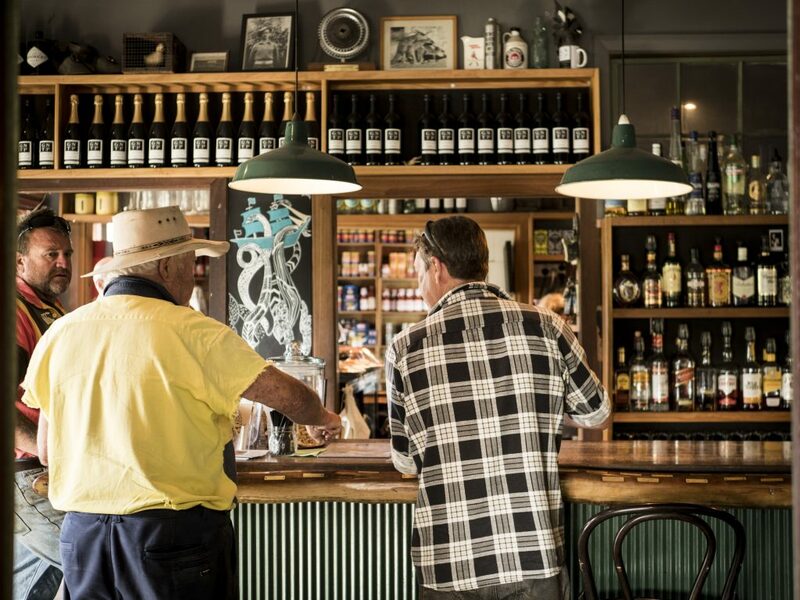 It’s pretty much a cluster of a few old sheds that have been turned into a restaurant, cafe and general store. 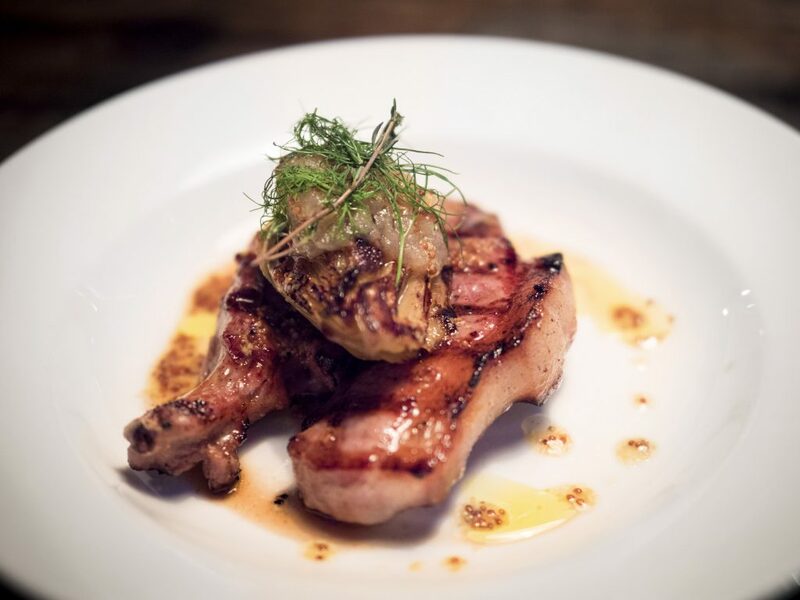 I was really impressed at the food’s quality and the staff are very friendly. One of the best parts about the Trading Post was that our dinners came with bread and salad, which was laid out on a separate table. The salads were gourmet and the bread wasn’t in short supply. A huge high five to Canyon. Our gut feeling was that the Grail hadn’t really been tested to a level we thought was appropriate for the hype it had received. Canyon made some bold statements around the Grail’s capability and yet we were yet to truly see it being interrogated in the real world. 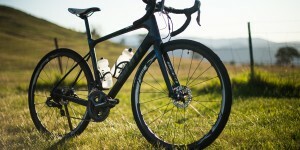 Well, we can tell you as fact that, while the Hover Bar, racy design and carbon wheels appear better suited to the pavement, the Grail is very much the adventurer’s dream. Additionally, a ride of this duration wouldn’t have been possible in such comfort without the support of Santini Australia kit. Northwave shoes ensured our feet were appropriately covered for times when we could no longer pedal. BBB Australia kindly supplied all our other items, including essential eyewear protection and hydration vessels along with tyre gauge. How low is too low? Well, now we know. Tubeless tyres are not optional (in our opinion) in these parts. 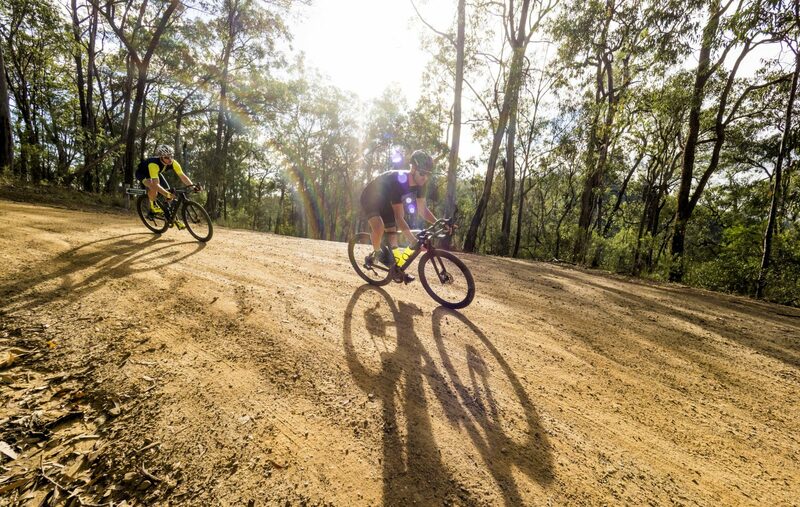 If you’re heading out of bounds, go tubeless and go wide when it comes to tyre width. Don’t look to save grams when it comes to rubber. Fit a sturdy pair of tyres – we love the WTB Nano – and play around with the pressure. The best way to achieve optimal handling for your weight and riding style is with a gauge. 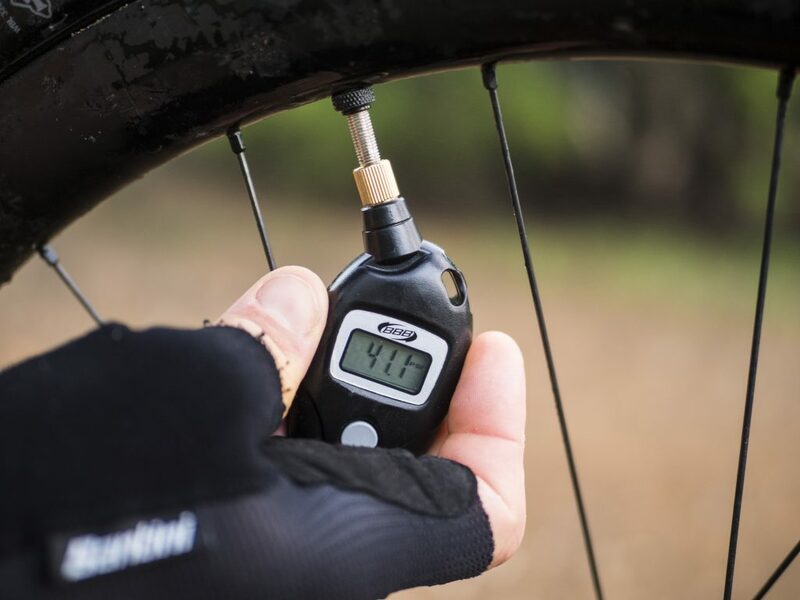 Compatible with Presta and Schrader valves, the lightweight digital meter from BBB provides the most accurate reading possible, and with a maximum reading of 11 bar (160psi), it has far more grunt than you’ll ever need. The Canyon Grail was the perfect machine for this off-road adventure. There are no compromises when it comes to bike choice in the Yengo. 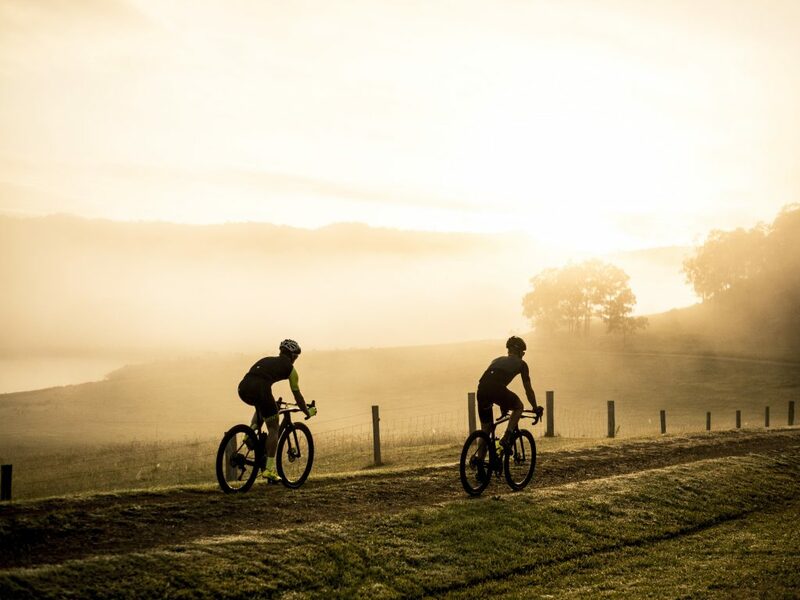 Adventure, CX or gravel – whatever you or your mates call it, just ensure you’re properly equipped. 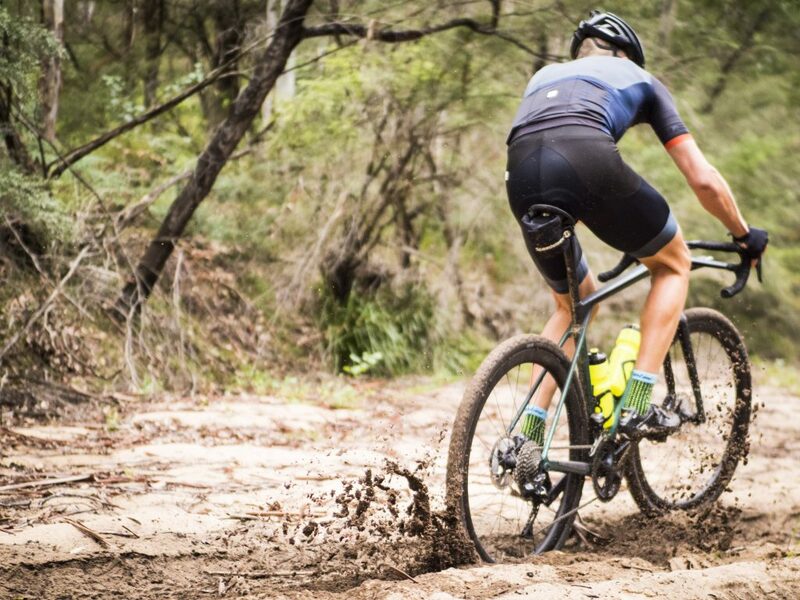 Discs, robust tubeless tyres and plenty of gears. Anything else and you’ll be in for a tough – or perhaps tougher – day. 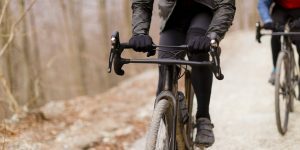 The Grail turned heads during its March 2018 release thanks to its unique Hover handlebar (or the ‘bunkbed’, as a friend of mine refers to it). The purpose of the riser bar is to position the rider upright when riding on the flats and to provide some extra cushioning thanks to the extra flex in the bars.The height discrepancy was a fun novelty when repositioning hands between the flats, hoods and drops, and the different positions worked well over diverse terrain. Getting into the drops took some time to get used to, but I found that if I wrapped my thumb over the flat, lower handlebars and used my index finger to brake, it was quite comfortable – just remember your gloves. Handlebars aside, the Grail is everything you need in an adventure bike. We fitted WTB Nano 2.0 tubeless tyres for this trip and it welcomed the 40mm bulge, with plenty of space for more. 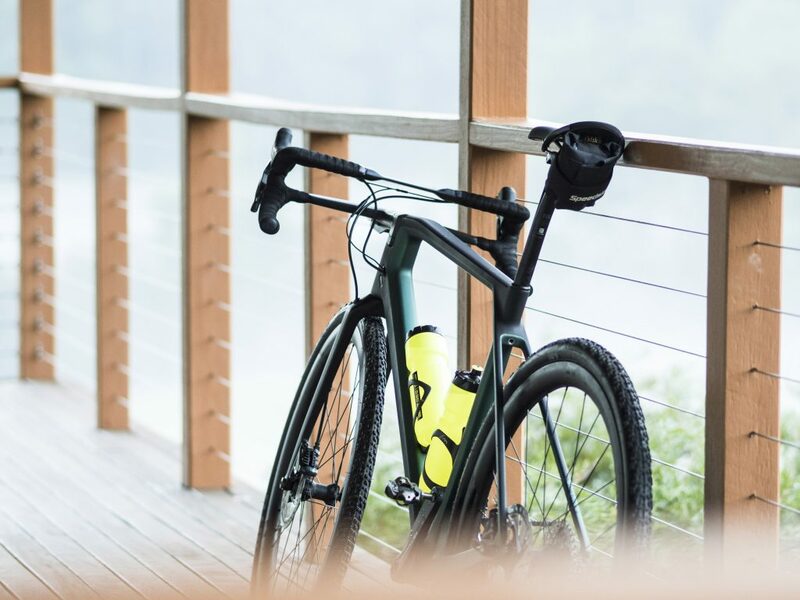 It felt more nimble than other off-road suggested drop-bar bikes thanks largely to a relatively sharp seat tube. The upright angle was a bit fluid, however, thanks to Canyon’s brilliant split seat post, which flexes significantly for a comfortable ride. It’s also available aftermarket if you’re after a little more cushion on your current steed. 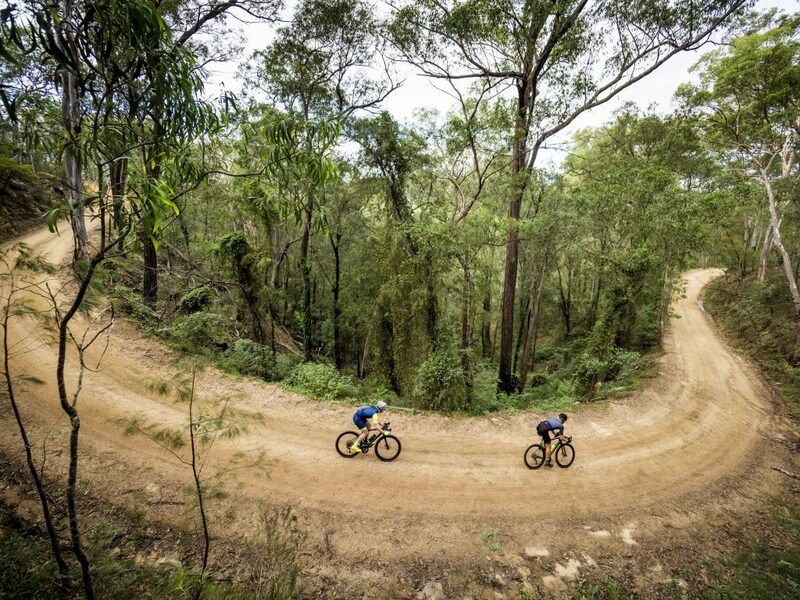 Everyone loves riding a loop, and it’s the best way to ride the Yengo. We began at the Great Northern Trading Post (GNTP) at Laguna and headed south on Great North Road for a short while before turning right onto Yengo Creek Road. It’s easy to spot as there are about a dozen letterboxes where the roads meet. 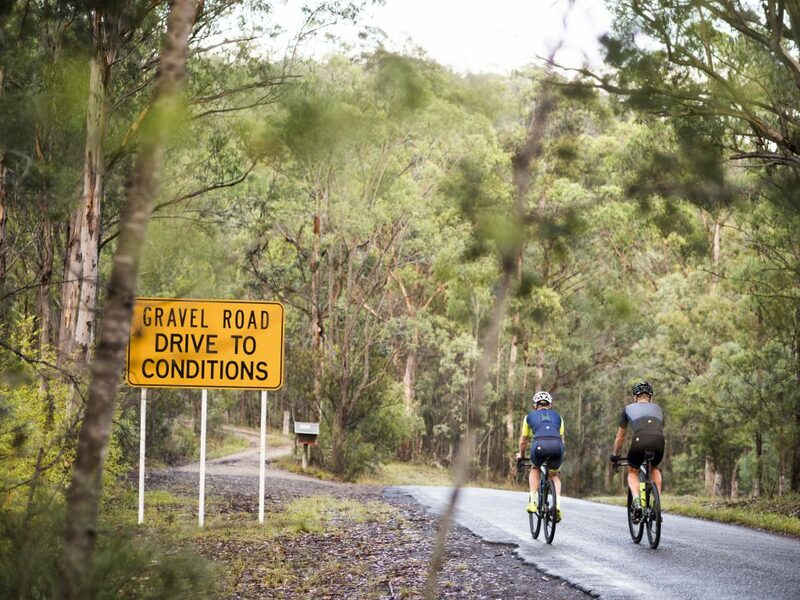 After a brief climb, the gravel begins and we descended Yengo Creek Road. At the bottom, there’s an intersection with more letterboxes and a farmhouse on either side. 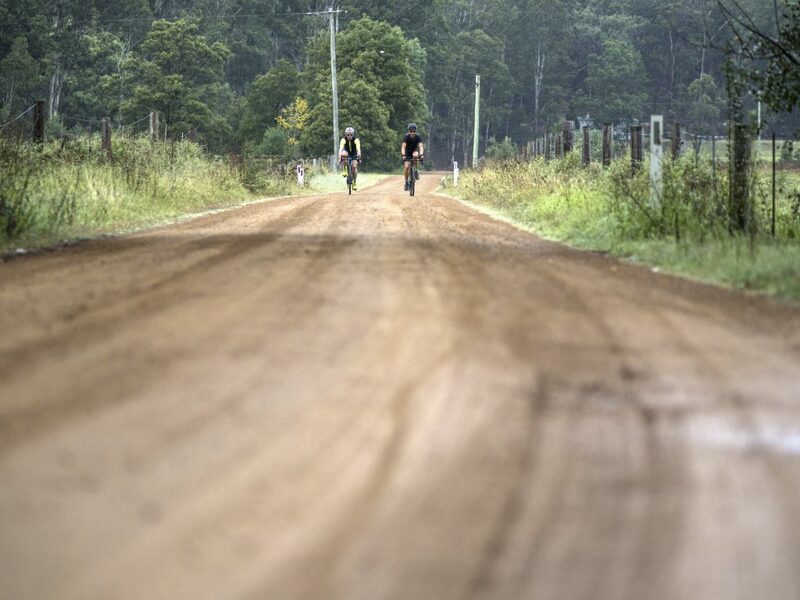 Turn right and enjoy fl at gravel track for about 15km till you reach Wollombi. Hang a left onto Paynes Crossing Road (a relatively busy bitumen road) and keep left at Wollombi Road to continue to Stockyard Creek Road. Yengo Unchained originally appeared in Cyclist #33. Subscribe to Cyclist for as little as $58 for six issues, delivered direct to your door.